The new smartphone will wage the war for Motorola in the entry-level smartphone segment, with an arsenal that comprises better hardware than rivals, the clean version of Android OS, and a price that will be hard to match. Moto E is pitted against the economical smartphones from Samsung, Nokia, Sony, as well as Indian brands like Micromax, Karbonn, Lava etc. We played around with Moto E at its global launch event to bring you our first impressions and help you decide whether it is the best smartphone at the killer price of Rs 6,999. Moto E has a 4.3-inch display with 960x540p resolution, making it the only smartphone offering a high quality display at this price point. The dual sim phone runs on the latest Android 4.4 (KitKat) OS, and Motorola has promised that it will upgrade the smartphone to the next major version of Android. The smartphone packs a 1.2GHz dual-core Snapdragon 200 processor, with 1GB RAM and 4GB internal storage. Unlike Moto X and G, this phone supports microSD cards for storage expansion. The budget offering of Motorola sports a 5MP camera on the back, but does not have rear LED flash and front camera. It can access the internet over 2G, 3G and Wi-Fi networks, while data can be transferred via microUSB 2.0 and Bluetooth 4.0. The smartphone has a decent 1,980mAh battery and Motorola claims it can last a whole day once fully charged. Motorola has used a nano-coating that will make the smartphone resistant to splashes, so that it does not get damaged in rain. 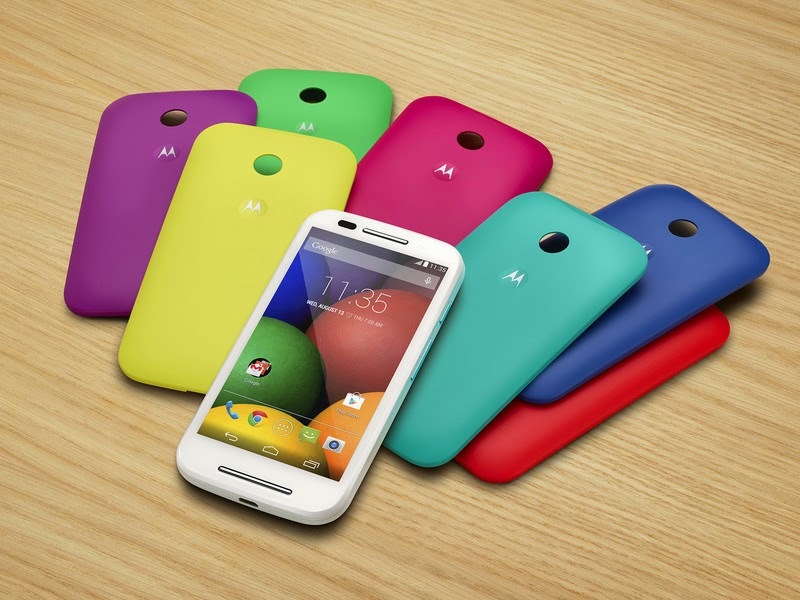 Moto E will come in black and white colours and Motorola is offering swappable back covers and grip shells.